Just off our coast between the mainland and the Channel Islands, we have a major highway for large cargo ships. Unfortunately, these shipping lanes overlap with prime feeding grounds for the largest seasonal population of endangered blue whales in the world. In 2007, five blue whales were killed as a result of ship strikes in the Santa Barbara Channel. This number, while large enough to be worthy of attention by itself, served as an indicator of a larger problem. Scientists suggest that up to ten times this number may actually be struck and killed, since most whales are negatively buoyant, and sink, thus going undetected if struck. In 2014, EDC and our partners launched a Vessel Speed Reduction project, providing cash incentives to shipping companies to slow down when passing through the Santa Barbara Channel. 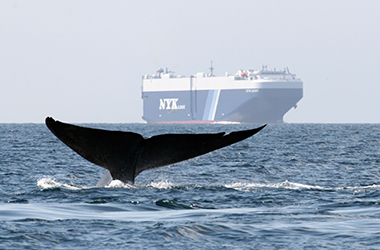 If cargo ships slow down, a whale’s chances of avoiding or surviving a ship strike go way up – and it turns out that we on land also benefit from breathing less polluted air. Cargo ships are the highest polluter of ozone-forming nitrogen oxide (NOx ) in Santa Barbara County. Slower ship speeds reduce ship emissions and help us meet state public health standards, including benefits for children and seniors who are most at risk. Since its inception, the Vessel Speed Reduction project has been expanded to include the Bay Area. In addition to this program, we are working on other strategies to improve protections for migrating whales, including designation of Areas To Be Avoided and moving shipping lanes to avoid the most critical feeding and migrating areas.